Our stitched women’s leather belts are simultaneously decorative and functional—perfect for pulling together a stylish outfit. Created using the same leather used to make our dreamy Goodyear-welted shoes, our collection of leather belts for women impresses with a harmonious selection of colours and materials. 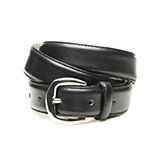 We offer two different leather widths and four kinds of buckle closures; we have a belt to suit every taste. 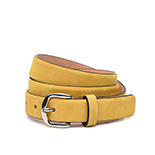 Two-layer stitched, full-leather belt for women in fine, yellow velours. 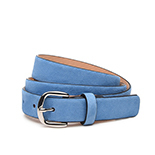 Two-layer stitched, full-leather belt for women in fine, light-blue velours. Women’s leather belts have long been considered more than merely practical; they serve as elegant accessories. Made from the same leather as our Goodyear-welted women’s shoes, our collection of premium leather belts for women encompasses a variety of styles, colours and patterns. 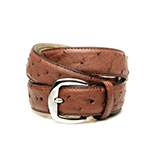 Leather belts hearken back to a long history, one that began in the Bronze Age. While belts fell into oblivion over the centuries, at the beginning of the 20th century they were rediscovered as a practical means of holding up trousers, dresses and skirts. Today, this small but crucial accessory reveals its wearer’s knack for women’s fashion. After all, even if your shoes stylishly match the rest of your clothing, a women’s belt in the wrong material, colour or shape can quickly ruin an entire look. The stitched women’s leather belts in our collection make putting together outfits pure child’s play. From sleek to striking, narrow to broad, made of French Calf or of exotic leather, our collection of stitched women’s leather belts offers every kind of belt a women might need to stylishly top off her outfit. 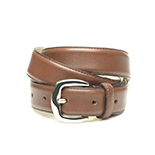 Support the fit of your clothing while taking advantage of the visual merits of our stitched women’s leather belts. For a youthful, trendy look, you can experiment with colours and patterns, while for a business event a subdued black leather belt or a belt in a classic brown shade are always excellent options. Our leather belts for women are made from the same leather as our Goodyear-welted women’s shoes—moreover, our belts also boast the same finish as our handcrafted full-leather shoes. 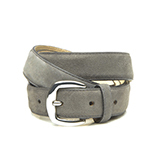 Each women’s belt is fastened by means of a silver-coloured buckle closure. We offer four different buckle options; each is made entirely of zamac, a fine zinc alloy, making the belts suitable for those with a nickel allergy. 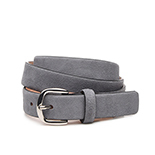 Gently rounded at the edges, the silver buckle closures underscore the timeless elegance of our leather belts for women. The women’s leather belts in our collection each consist of two layers of leather that have been tightly stitched together. The outer layer on our classic belts is made of the finest calfskin, while the inner layer is made of calfskin that has been left undyed. Since it has been submitted to a gentle tanning process, the leather on the inner layer is guaranteed to be easy on the skin, and also boasts natural durability. Our velours models will thrill lovers of extravagant design, while our deerskin and ostrich leather varieties are exotic through and through. The latter two types of leather have been sourced from special breeders who operate in compliance with CITES. 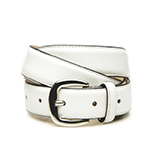 We offer women’s leather belts in two different widths, with four different buckle closures to choose from. Whether you prefer an average belt width or if you tend to go for its narrower counterpart, all of our stitched full-leather belts help you make a stylish appearance in any outfit. Each belt features the traditional number of five belt holes, and the length of each belt can be customized and shortened as desired. 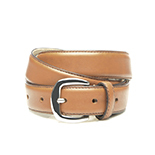 Belt length refers to the distance between the outer edge of the belt buckle and the middle belt hole. 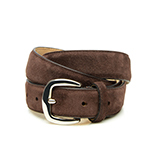 To find the perfect belt length for you, match it up to the waist size of your trousers. Our stitched leather belts for women are truly sophisticated accessories.